Are you one of those people who turns lemons into lemonade? One time Indianapolis resident and dentist, Dr. S. B. Friedland sure was. It was the end of 1948, and the wrecking balls were looming. 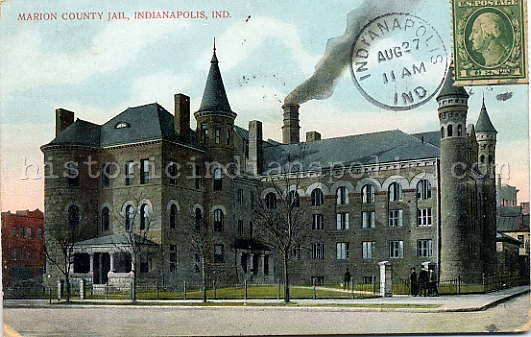 One of the most beloved structures to ever stand in Indianapolis was about to be torn down. No more opera house, no more hotel on the northwest quadrant of the circle, English’s was doomed. Budding entrepreneur and real estate investor, Dr. Sol B. Friedland recognized an opportunity and got creative with a life size shell game. Friedland operated the English Hotel when the owners decided to demolish it. Here’s where he decided to make lemonade out of those lemons. 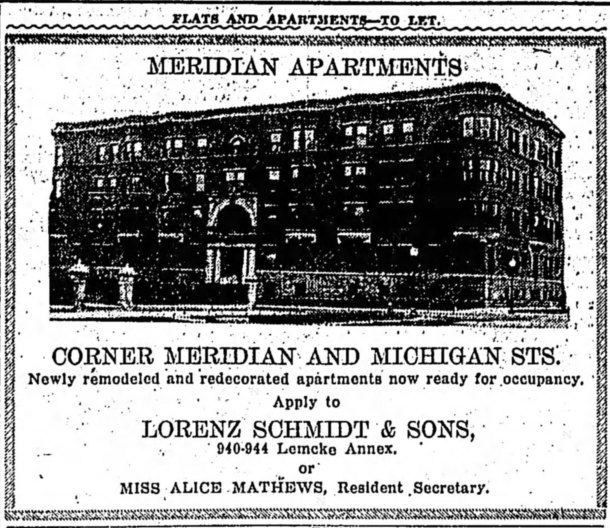 Just a few blocks north, Friedland acquired the Meridian Apartments, standing on the northwest corner of Meridian and Michigan streets, for $100,000. He planned to convert the 44-apartment building into a 150-room hotel and rename it the “English Hotel.” He reasoned that the English Hotel had such a positive and national reputation, that he could transfer that cache elsewhere; why should losing the building mean losing the business? “By continuing the English Hotel, we will be able to accommodate not only those people who have patronized it for many years, but we also will be able to retain employees for whom the demolition of the English was a personal tragedy,” Dr. Friedland said. 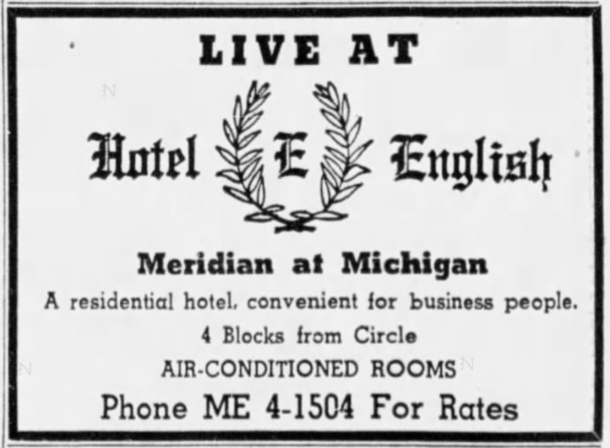 As the $100,000 renovation plans for the former Meridian Apartments began on the first and second floors in December 1948, all the furnishings of the former English Hotel were being shawshanked up the street to basement of the new English Hotel. “310 mattresses and bedsprings, about as many dressers and uncounted chairs, tables, lamps and miscellaneous articles, many of them part of the original furniture the hotel had when it opened,” was due to be moved within approximately one week. Despite having some tenants–including the Indianapolis Symphony orchestra, who moved into the building in June 1949– the remodeling was still going on in February 1950 when Dr. Friedland leased the “new” English building to the “English Hotel Corp” headed by Daniel Katzman of Omaha, Nebraska, who would be the new manager. Katzman said it would be operated as a transient hotel. 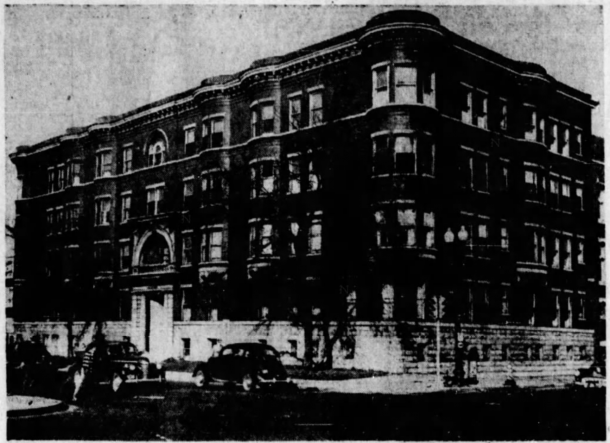 Not a full four months later, the lease was sold–furniture, fixtures and all–to the Ingram-Cunningham Hotel Company of Nashville, Tennessee. 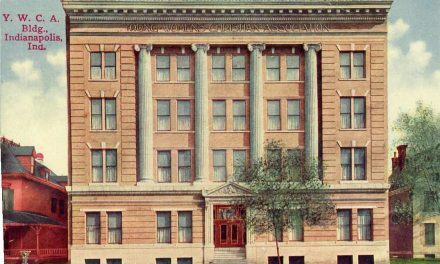 Ingram-Cunningham already operated the York Hotel (previously called the Colonial Hotel) in Indianapolis; Clarkston and Tulane Hotels in Nashville; Columbia Hotel in Kalamazoo, Michigan; and the Jefferson Davis Hotel at Annista, Alabama. The “New Hotel English” offered rooms for local residents and visitors. 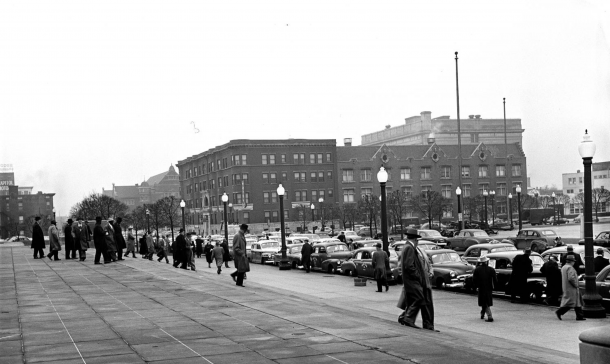 The work of “modernizing” the structure included adding a coffee shop and storerooms along the lower level, facing Meridian Street. 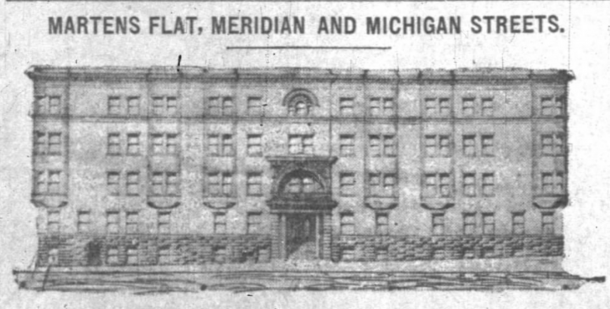 First rendering of Martens Flats, from a 1900 newspaper, which became the Meridian Apartments, and then New English Hotel. But not for long. 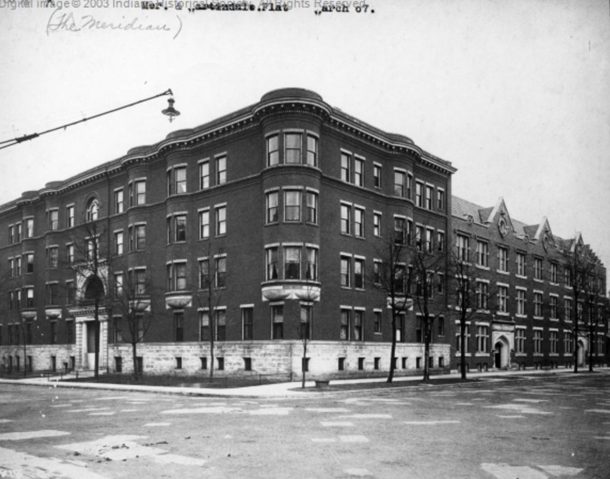 In April 1901, M. H. Spades purchased the new apartment building and the name of the building was changed to “The Meridian.” Though Spades immediately announced plans to add two additional stories with 12 more apartments on each floor, a spacious public dining room and reception hall, those plans never came to fruition. 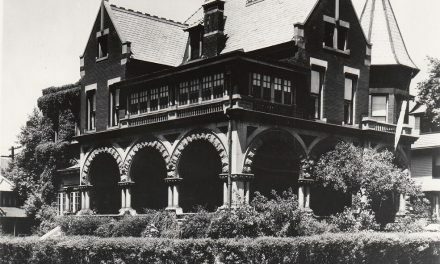 Martens purchased the land for this property in 1899 from the estate of local banker, Alfred Harrison, wiping Harrison’s former home off the map to build this much larger structure. One forgotten piece of the story, was that the site was also among the locations under consideration for the Art Association, as they sought grounds for a permanent new home. 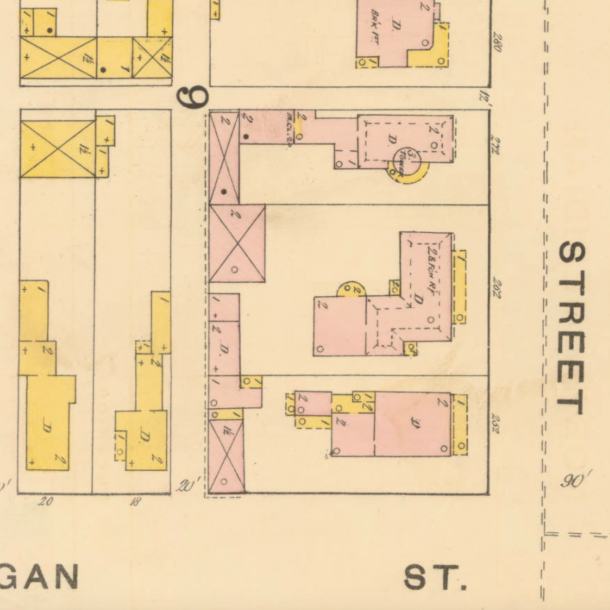 1887 Sanborn showing northwest corner at Meridian and Michigan streets, when Alfred Harrison’s home stood there. Image: courtesy IUPUI Library. Late in 1968, the American States Insurance Company announced their purchase of the Stratford Apartments, visually outlined here, that would be razed for a new 6-story building, expanding the insurance business’ office space. In 1968, when demolishing old buildings seemed the most popular local hobby, the American States Insurance Group acquired The Stratford Apartments building next door, with plans to raze and replace it with a 6-story expansion of their offices at 542 North Meridian Street, the next property north of the Stratford, on the same block. The insurance company also acquired the Foster Hotel at 511 North Illinois and the Matzke building, at 509 North Illinois, also both to be razed–for parking rather than office space. 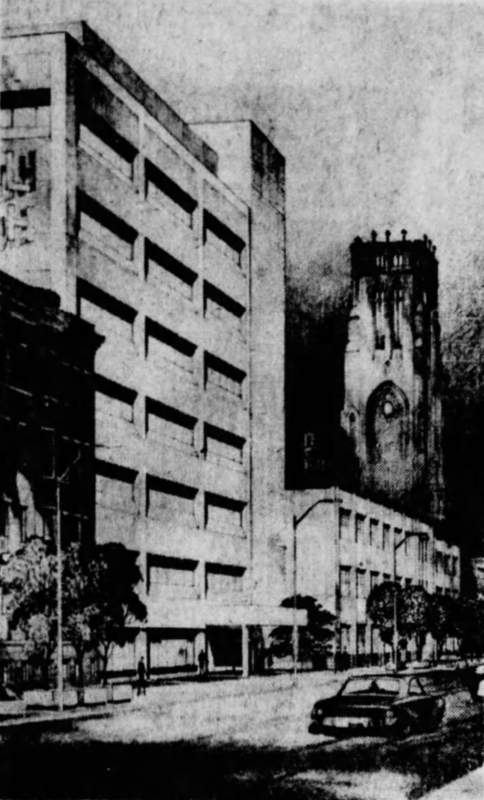 1969 Holabird & Root rendering of new 6-story building to replace the Stratford Apartment building, showing the “Hotel English” remaining to the south of the new building. After that, it didn’t take long for Sol Friedland, still owner of the Hotel English, to reach an agreement to sell the building to the American States Insurance Company, making their company the sole tenant of the west side of the 500 block of North Meridian. 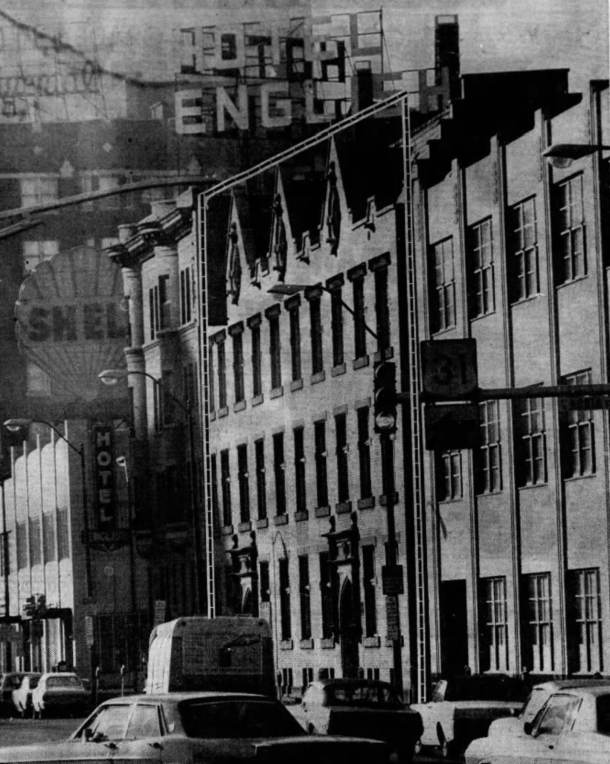 Some of the tenants of the “Hotel English,” had leases through 1973, and the agreement assured them they would be allowed to stay through the end of their lease. But they saw the writing on what was left of the soon-to-be-demolished wall, and all residents were out by the end of 1971. 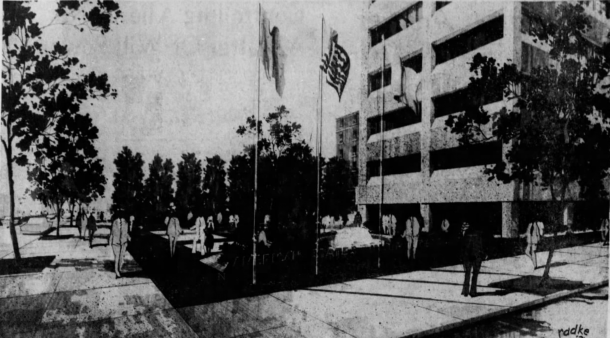 In fact, architects’ renderings of the new “mini-park” that would replace the building showed up in the press in September and the whole red brick building was erased from the map by November 1971. Holabird & Root were also tapped to design a “mini park” atop the former site of the Meridian Apartments in 1971, after they designed the replacement for the Stratford Apartments. 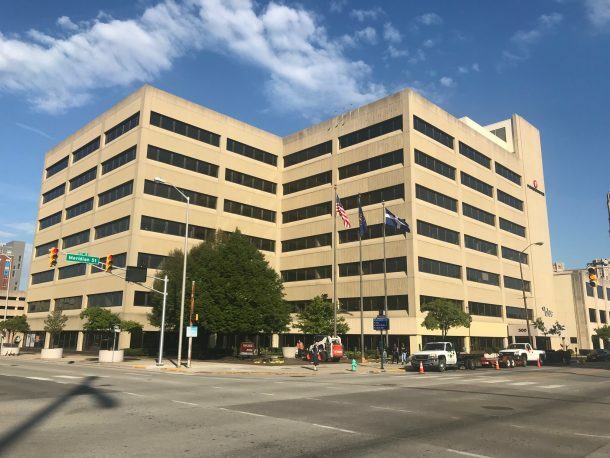 The American States Insurance company, despite its great and long-standing local financial success was a failure when it came to doing good for the city’s historic fabric. 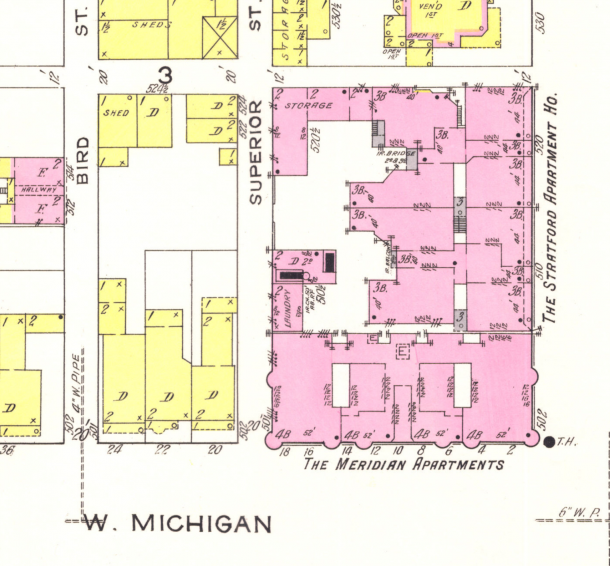 Not only did they tear down the bulk of this block of Meridian, and the block behind it south of the Masonic Lodge– which is still a sea of asphalt– but they also managed to demolish the stunning Maennerchor building, on the northwest corner of Michigan and Illinois streets, again, for parking. Today, the once beautiful corner looks like a boring beige nightmare. Ever hear that saying: “You can either be part of the solution or part of the problem”? For someone who appreciates aesthetically pleasing surroundings, this is an example that again brings to mind the need this city has for some design guidelines as concerns new construction. If we had that, perhaps we might again, one day, be as architecturally captivating as we once were. A big block of bleah. Thanks, American States Insurance. Then & Now: The Cuyler Studio, 1527 N. College Ave.